In organic chemistry, the cycloalkanes (also called naphthenes, but distinct from naphthalene) are the monocyclic saturated hydrocarbons. In other words, a cycloalkane consists only of hydrogen and carbon atoms arranged in a structure containing a single ring (possibly with side chains), and all of the carbon-carbon bonds are single. Cycloalkanes are named analogously to their normal alkane counterparts of the same carbon count: cyclopropane, cyclobutane, cyclopentane, cyclohexane, etc. The larger cycloalkanes, with more than 20 carbon atoms are typically called cycloparaffins. The cycloalkanes without side chains are classified as small (cyclopropane and cyclobutane), common (cyclopentane, cyclohexane, and cycloheptane), medium (cyclooctane through cyclotridecane), and large (all the rest). Each is an isomer of its alkene counterpart—for example, cyclopropane has the same chemical formula (C3H6) as propene. The naming of polycyclic alkanes such as bicyclic alkanes and spiro alkanes is more complex, with the base name indicating the number of carbons in the ring system, a prefix indicating the number of rings (e.g., "bicyclo-"), and a numeric prefix before that indicating the number of carbons in each part of each ring, exclusive of junctions. For instance, a bicyclooctane that consists of a six-membered ring and a four-membered ring, which share two adjacent carbon atoms that form a shared edge, is [4.2.0]-bicyclooctane. That part of the six-membered ring, exclusive of the shared edge has 4 carbons. That part of the four-membered ring, exclusive of the shared edge, has 2 carbons. The edge itself, exclusive of the two vertices that define it, has 0 carbons. There is more than one convention (method or nomenclature) for the naming of compounds, which can be confusing for those who are just learning, and inconvenient for those who are well rehearsed in the older ways. For beginners it is best to learn IUPAC nomenclature from a source that is up to date, because this system is constantly being revised. In the above example [4.2.0]-bicyclooctane would be written bicyclo[4.2.0]octane to fit the conventions for IUPAC naming. It then has room for an additional numerical prefix if there is the need to include details of other attachments to the molecule such as chlorine or a methyl group. Another convention for the naming of compounds is the common name, which is a shorter name and it gives less information about the compound. An example of a common name is terpineol, the name of which can tell us only that it is an alcohol (because the suffix "-ol" is in the name) and it should then have a hydroxy (–OH) group attached to it. An example of the IUPAC method is given in the adjacent image. In this example the base name is listed first, which indicates the total number of carbons in both rings including the carbons making up the shared edge (e.g., "heptane", which means "hepta-" or 7 carbons, and "-ane", which indicates only single bonding between carbons). Then in front of the base name is the numerical prefix, which lists the number of carbons in each ring, excluding the carbons that are shared by each ring, plus the number of carbons on the bridge between the rings. In this case there are two rings with two carbons each and a single bridge with one carbon, excluding the carbons shared by it and the other two rings. There is a total of three numbers and they are listed in descending order separated by dots, thus: [2.2.1]. Before the numerical prefix is another prefix indicating the number of rings (e.g., "bicyclo-"). Thus, the name is bicyclo[2.2.1]heptane. The group of cycloalkanes are also known as naphthenes. Cycloalkanes are similar to alkanes in their general physical properties, but they have higher boiling points, melting points, and densities than alkanes. This is due to stronger London forces because the ring shape allows for a larger area of contact. Containing only C–C and C–H bonds, unreactivity of cycloalkanes with little or no ring strain (see below) are comparable to non-cyclic alkanes. Ring strain is highest for cyclopropane, in which the carbon atoms form a triangle and therefore have 60° C–C–C bond angles. There are also three pairs of eclipsed hydrogens. The ring strain is calculated to be around 120 kJ mol−1. Cyclobutane has the carbon atoms in a puckered square with approximately 90° bond angles; "puckering" reduces the eclipsing interactions between hydrogen atoms. Its ring strain is therefore slightly less, at around 110 kJ mol−1. For a theoretical planar cyclopentane the C–C–C bond angles would be 108°, very close to the measure of the tetrahedral angle. Actual cyclopentane molecules are puckered, but this changes only the bond angles slightly so that angle strain is relatively small. The eclipsing interactions are also reduced, leaving a ring strain of about 25 kJ mol−1. In cyclohexane the ring strain and eclipsing interactions are negligible because the puckering of the ring allows ideal tetrahedral bond angles to be achieved. As well, in the most stable chair form of cyclohexane, axial hydrogens on adjacent carbon atoms are pointed in opposite directions, virtually eliminating eclipsing strain. After cyclohexane, the molecules are unable to take a structure with no ring strain, resulting in an increase in strain energy, which peaks at 9 carbons (around 50 kJ mol−1). After that, strain energy slowly decreases until 12 carbon atoms, where it drops significantly; at 14, another significant drop occurs and the strain is on a level comparable with 10 kJ mol−1. After 14 carbon atoms, sources disagree on what happens to ring strain, some indicating that it increases steadily, others saying that it disappears entirely. However, bond angle strain and eclipsing strain are an issue only for smaller rings. Ring strain can be considerably higher in bicyclic systems. For example, bicyclobutane, C4H6, is noted for being one of the most strained compounds that is isolatable on a large scale; its strain energy is estimated at 267 kJ mol−1. The simple and the bigger cycloalkanes are very stable, like alkanes, and their reactions, for example, radical chain reactions, are like alkanes. ^ Wiberg, K. B. (1968). "Small Ring Bicyclo[n.m.0]alkanes". In Hart, H.; Karabatsos, G. J. Advances in Alicyclic Chemistry. 2. Academic Press. pp. 185–254. ISBN 9781483224213. ^ Wiberg, K. B.; Lampman, G. M.; Ciula, R. P.; Connor, D. S.; Schertler, P.; Lavanish, J. (1965). 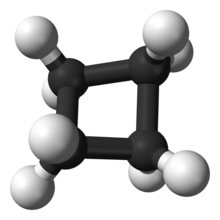 "Bicyclo[1.1.0]butane". Tetrahedron. 21 (10): 2749–2769. doi:10.1016/S0040-4020(01)98361-9.